"Delicious sweet and savory cocktail. Garnish with a strawberry." 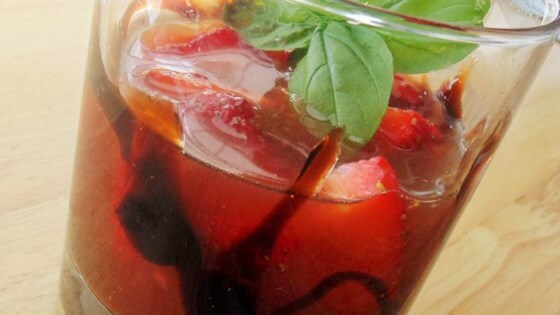 Place strawberries, basil, and agave nectar in a cocktail shaker and mash well with a muddler. Add ice, vodka, lime juice, and 1/4 ounce balsamic glaze. Cover and shake cocktail until the outside of the shaker has frosted. Swirl remaining 1/4 ounce balsamic glaze around the inside of a martini glass. Strain cocktail into the glass.